A powerful, reliable and lightweight rotary polishing machine to enable you to remove paint defects such as swirls, scratches and oxidation. Its 800w motor works off 230 volts and has variable load speed from 0 to 2800rpm, with a two lever gear system reducing output speed whilst maintain a high level of torque. It therefore gets through the job without strain. the gear head is alloy and the motor housing lightweight, tough composite. 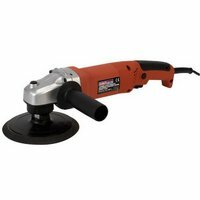 It has a spindle lock for easy pad removal and is supplied with a 150mm (6") hook and loop backing pad, polishing bonnet and side handle. "Very fast and efficient service from Vertar, item arrived within 36 hours. Thank you."